I have been receiving ipsy bags throughout the summer. My parents bought me a one-year subscription for my birthday which is an awesome gift idea for the woman in your life. It’s a present every month! 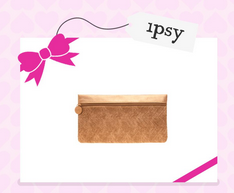 Basically, ipsy is a cosmetic subscription service. You can pay for ipsy each month or for a year (in which case you’d get a month free). Each month, you receive a bag with five high-end cosmetic products ranging from skincare to hair products, makeup and nail polish, and beauty tools like brushes. This all comes in a makeup bag designed exclusively by ipsy and it all arrives in one of those metallic pink bubble mailers that probably took over your Instagram at some point. Before receiving your first bag, you fill out a detailed, online quiz to choose which types of products you prefer, as well as your skin, hair, and eye colors. I have been so happy with the products I have received and this month is no exception. I particularly love the lux material and color of this month’s bag. Below are the products I knew I was receiving through my sneak peek email. My bag arrived yesterday and I opened it so excited and major bummer- there were a couple of problems. First off, I received two lipsticks and no lotion. Second, the amazingly smelling, high quality argan oil should probably have been individually wrapped because it spilled out and saturated my bag’s liner with oil. The rest of the products were fine but I contacted ipsy customer service about the lotion and oil/bag. Their primary mode of contact is email. A few hours later I received a thoughtful email back apologizing and issuing me an entirely new bag! I will let you know how it pans out when it arrives but the customer service experience was great. Prompt, thoughtful, apologetic, and willing to make things right. No wonder people love ipsy. If you’re interested in subscribing, ipsy costs $10 a month or $110 for a year. There is often a waiting list so feel free to use my referral code below to start getting your bags and earning points toward bonus products! Stay tuned for reviews and have a wonderful day, gorgeouses!